Sure, you could write your content anywhere: within your CMS, on a specific writing application like Scrivener, or on pen and paper like they did in the old days. 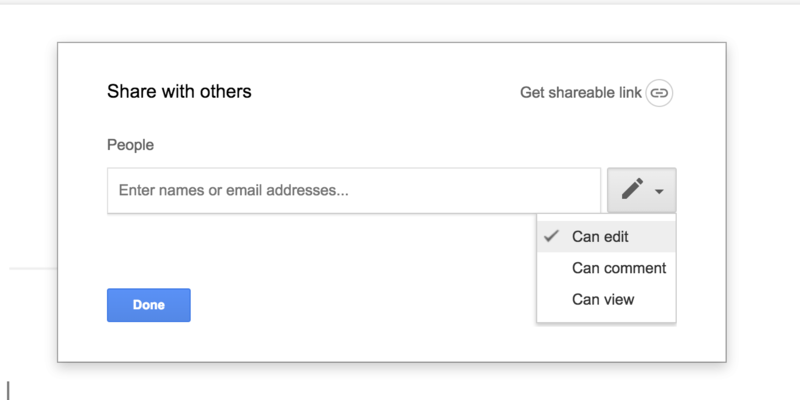 But Google Docs offers you the easiest and simplest way to format your content, share it with collaborators, and even upload immediately to whichever CMS you use. But you likely know this already. 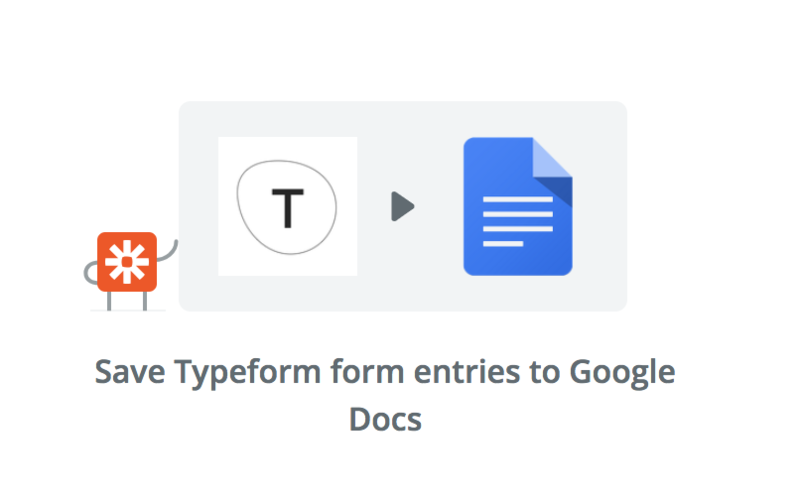 There’s a reason Google Docs is the number one SaaS tool for SMBs. 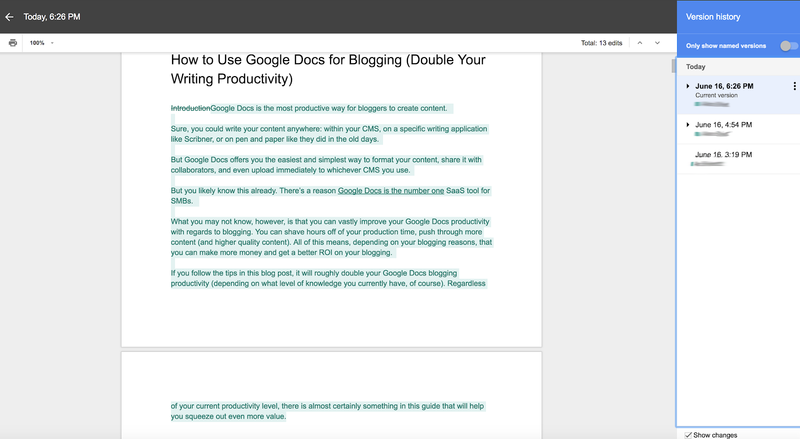 If you follow the tips in this blog post, it will roughly double your Google Docs blogging productivity (depending on what level of knowledge you currently have, of course). Regardless of your current productivity level, there is almost certainly something in this guide that will help you squeeze out even more value. 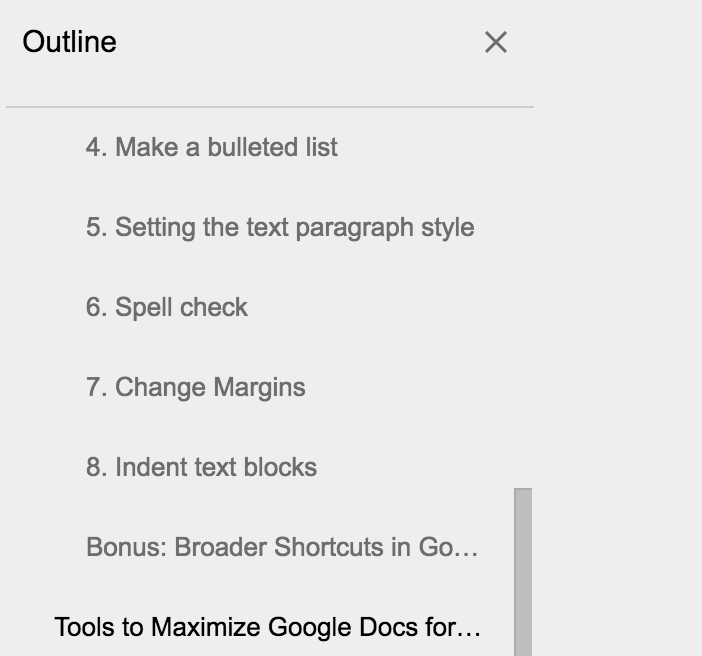 Past the tricks, tips, and tools, how do you really get productive while blogging in Google Docs? 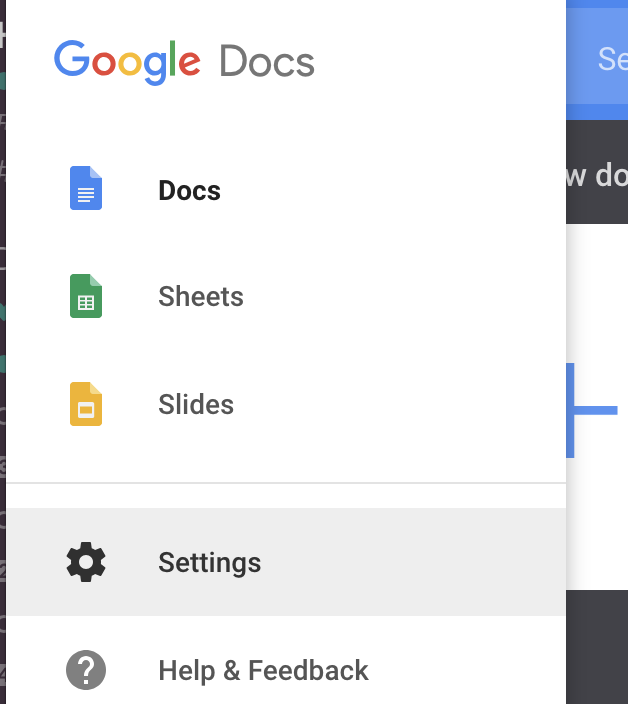 The beauty of Google Docs is that it lets us work connected to the internet so we can, in real-time, work with others, add notes from the web, or use any number of the extensions and tools mentioned above. The negative part? It allows you to work connected to the internet, where you’re more likely than not to be super distracted. While there are an unlimited amount of productivity tips out there, from Pomodoro timers to biphasic sleep scheduling, I recommend you just eliminate as many distractions as you can, to start. I consider this things that don’t actually add value or quality to your writing. This includes typing slowly, using slow point and click options instead of keyboard shortcuts, and wasting your time with administrative tasks like uploading Google Docs to WordPress (we have a tool for that so you can 2-5 hours per post). After that? It’s all up to you and your unique quirks. I like to drink too much coffee and listen to loud rap music while writing, and I can only write in the early morning and at night. Will that work for others? Probably not. When it comes to optimizing that last five percent of your productivity, you’ll really have to experiment with different working styles and methods, and find what works best for you. Eliminate distractions (close out other tabs and put your phone on Do Not Disturb). Use Wordable and other time saving tools. Everyone wants a quick and easy template, right? 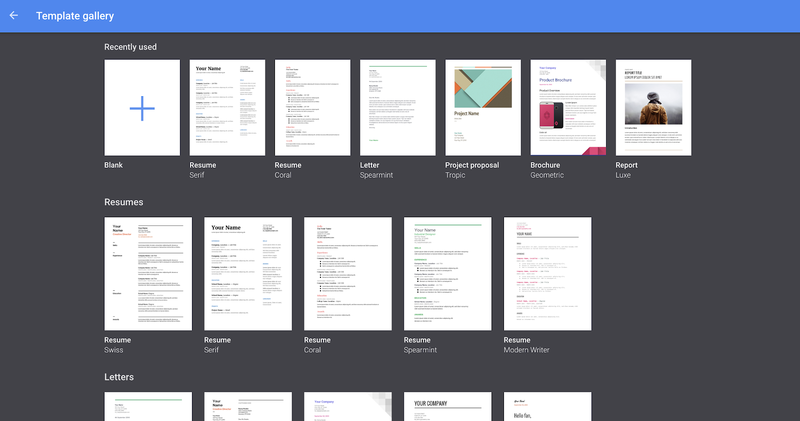 Google Docs does, indeed, offer many templates. They offer templates for resumes, essays, proposals, and more. They don’t really offer a blog post template though. So we made an easy to use template that you can just make a copy of and start writing. It’s nothing special; just a few formatting things done for you. 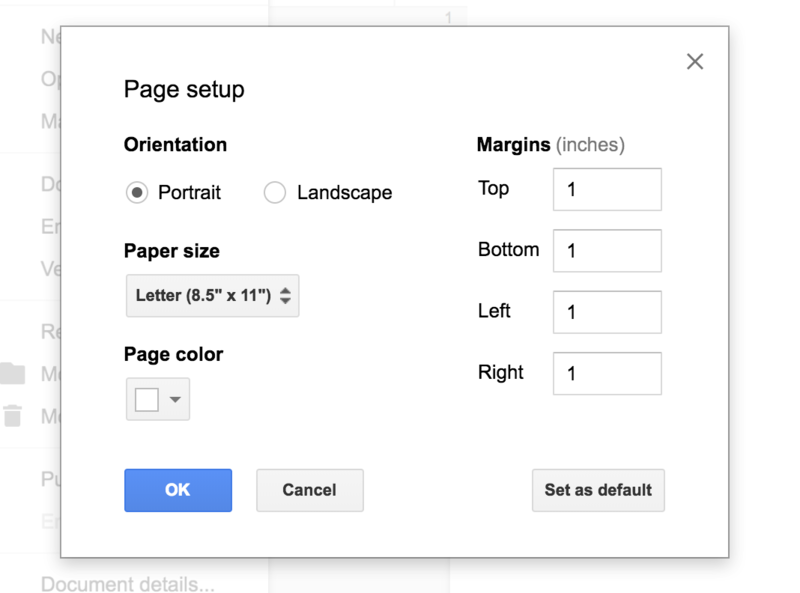 But feel free to check it out if you want a good Google Docs blog template. It doesn’t just have formatting, but also planning prompts to help you craft the article better. 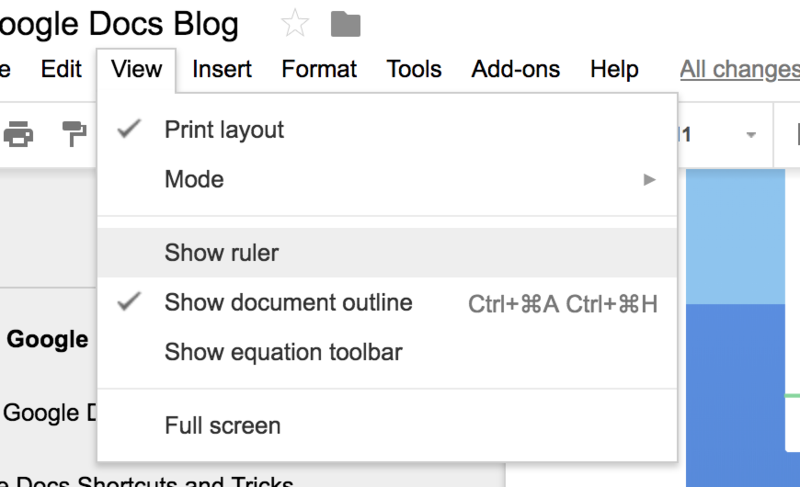 Now, let’s dive into the ways you can crank up your Google Docs blogging output. We’ll cover common Google Docs shortcuts and tricks, Google Docs add-ons, and then other tools that interact with Google Docs to create a better blogging experience. 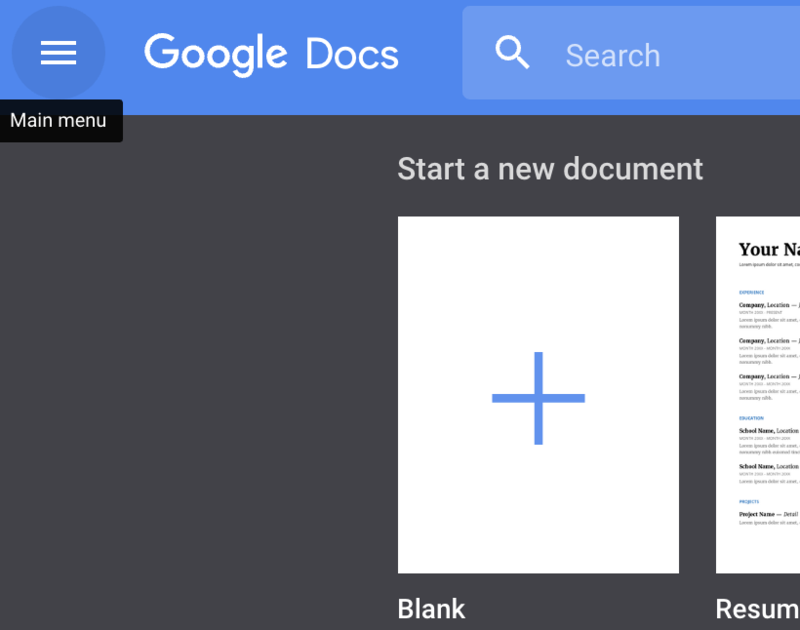 There are a few fundamental features of Google Docs that help you blog, but they also help you generally function in Google Docs more efficiently, regardless of what task you’re trying to accomplish. After all, writing is writing, and several features help you get writing done more quickly, whether you plan to publish it or not. I often find myself needing to align images to the center of the document, as well as needing to align text to the center as well. You’re going to need to bold text, italicize it, and underline it frequently (sometimes at the same time, if you really need to make a point). You might also need strikethrough text. Just use ⌘+Shift+X. …etc., you can see the pattern. This isn’t a keyboard shortcut, but it’s important. Quick recommendation, though: use Grammarly. 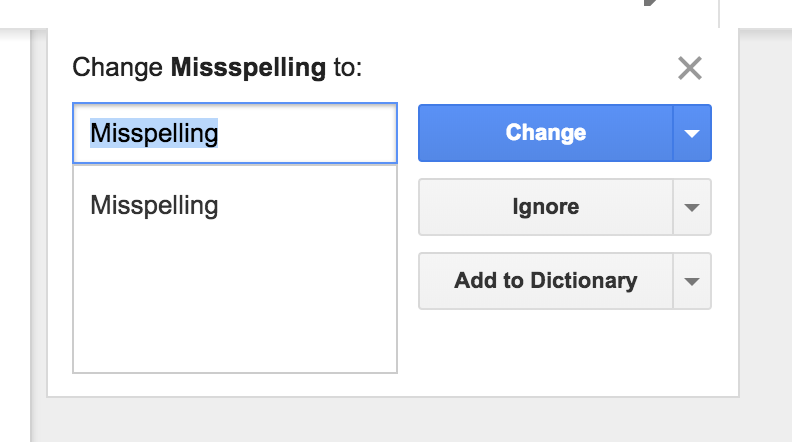 It’s way better than your average spell check tool. If you’re a prolific writer and not using Grammarly, you should definitely at least give it a spin. You can also set this stuff up to be the exact specification that you need by going to File > Page Setup. This is super useful if you want to use a long quotation or some other cited material. This is even more helpful if you’ll be collaborating with other writers and/or editors. It helps you get a top level view of your article, and you can easily navigate to different sections. To do this, just go to View and then Show document outline. The outline will open on the left. 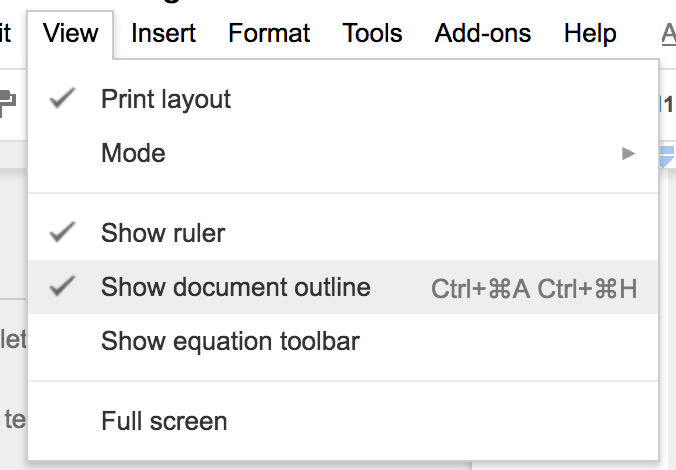 For keyboard shortcuts, use Ctrl+⌘A Ctrl+⌘H. Though I just keep my outline feature open all the time, just for simplicity and convenience. If you want to write on airplanes or while on the beach, I recommend enabling Offline Mode. This lets you work on documents while disconnected. Voila! You can open and edit documents even without the convenience of WiFi. Presumably, you’re working with other creators. 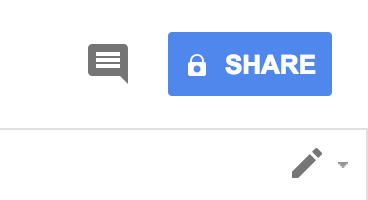 Google Docs is the best platform I know of for working with others and collaborating on projects. It’s pretty easy to do all of this. Just access the “Share” button on the top right hand side. Again, if you’re collaborating with other people, you likely want the ability to see older versions of the document. For instance, you may want to go back to an older version, or at least see what was previously written. 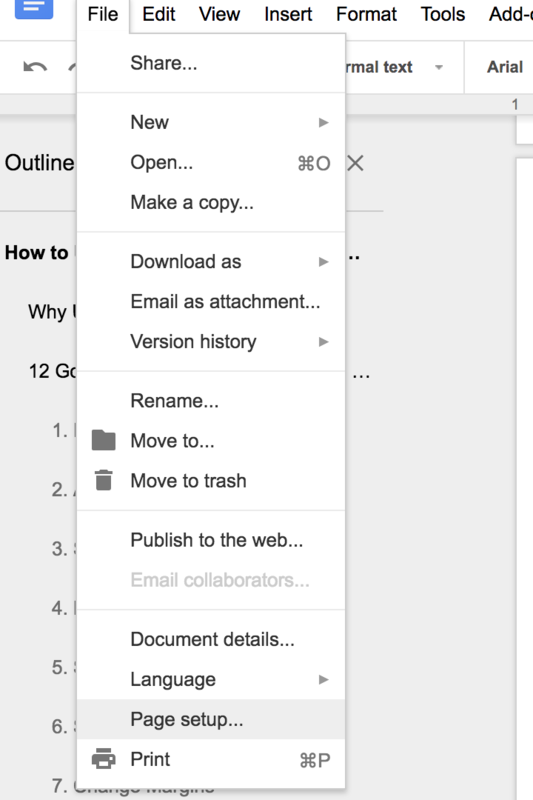 Google Docs lets you do that. All you have to do is go to File > Version History > See Version History. This gives you full access to every version of the document that has existed, as well as who made the changes on a given versions. You also have the option to restore old versions. 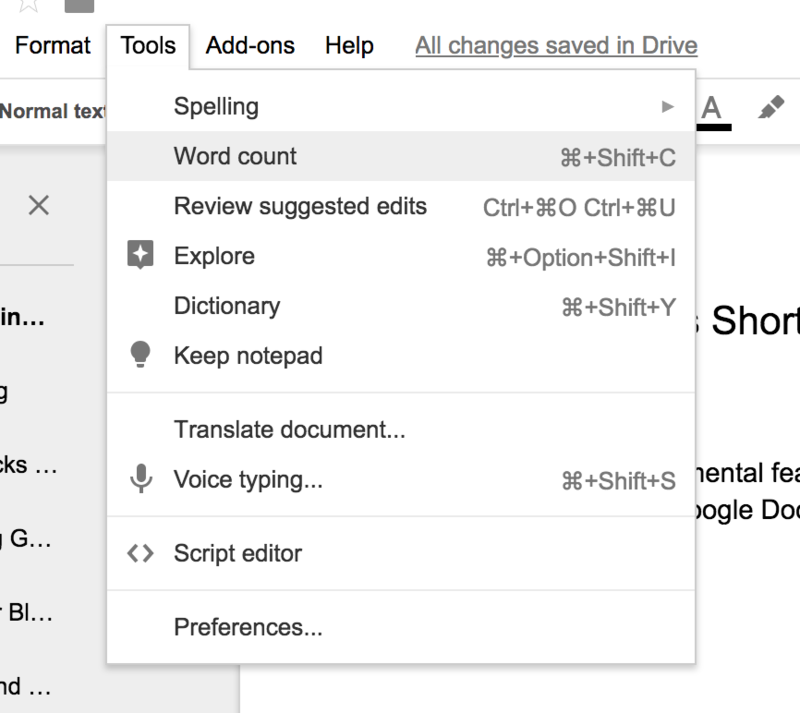 Shift + t = Create new document. Shift + p = Create new presentation. Shift + s = Create new spreadsheet. / = Search your Drive. 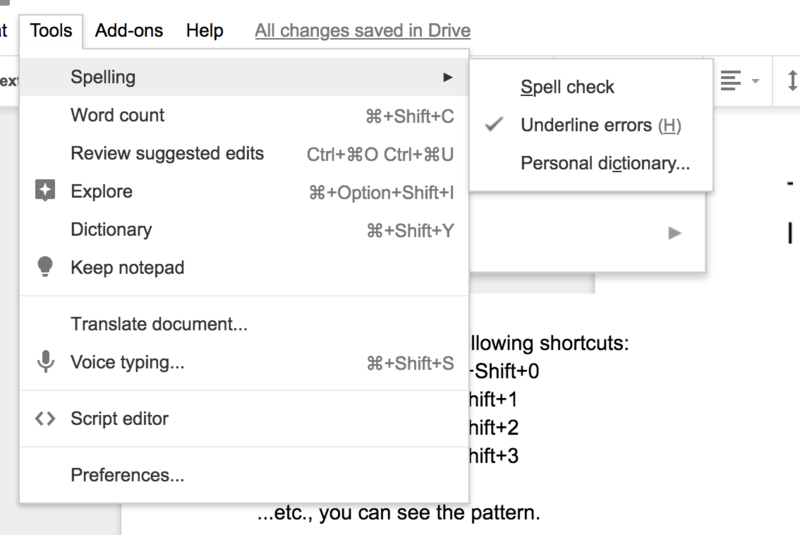 If you’re a real productivity nut, go over to Google’s own documentation and memorize all of their Google Drive shortcuts. Note that we did skip copy and paste, but everyone should know how to do that on your keyboard. Whatever you do, just try not to accidently use ⌘+W. It shuts down your browser/application. Google Drive, in its many capacities, has the additional power of letting you install add-on products to further increase its feature set, and therefore, your productivity. If you’re blogging, it should be an inherent fact that SEO is important. It’s where the long term traffic and business comes from. It’s not subject to quick spikes and excitement, but it’s what many blogs and businesses are built on. So how do you know you’re writing with SEO best practices in mind? Many people develop a fingertip feel for this, but the smart ones use a tool Like SEMrush’s SEO writing assistant. It really is a nifty little tool to help you be a better blogger. 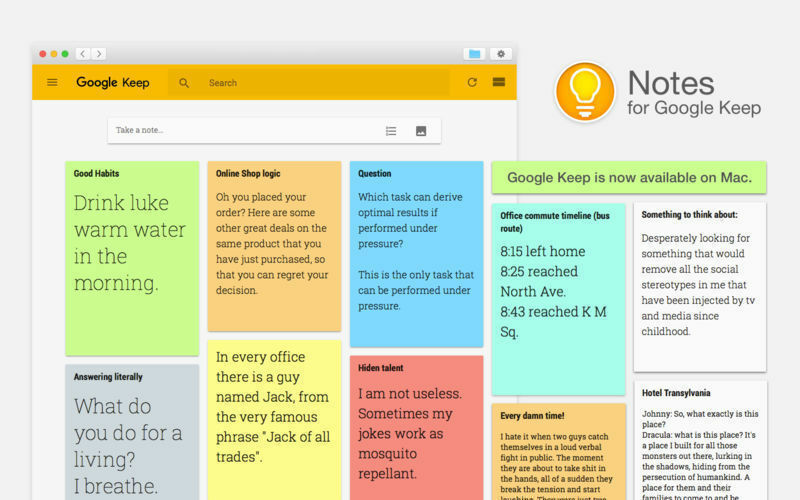 Google Keep allows you to clip notes and save and tag different notes. 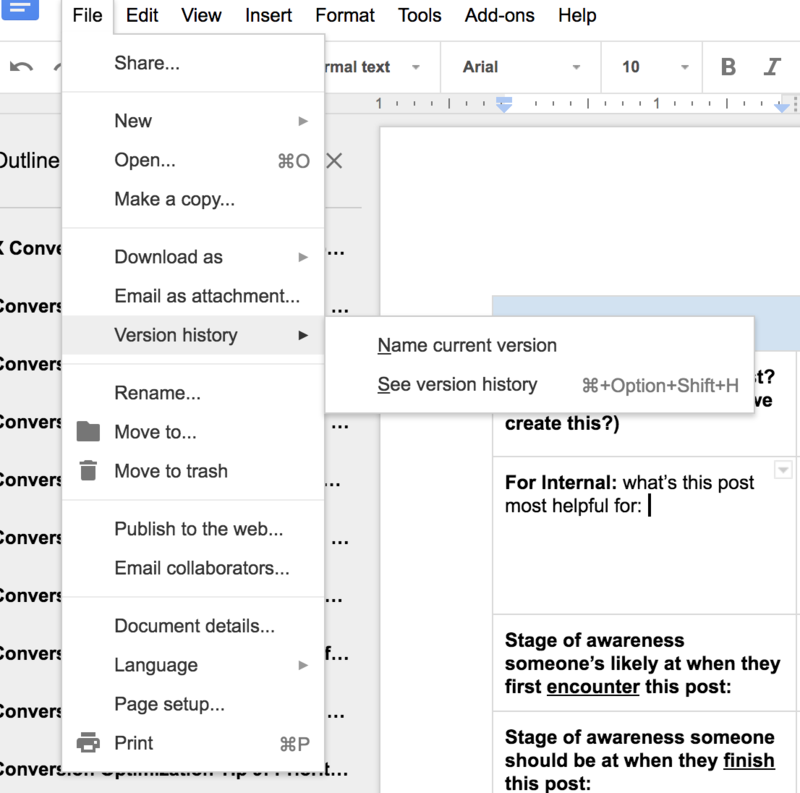 It’s kind of like Evernote, but immediately accessible via Google Docs. If you do a ton of research, or really, if you just take notes in general (like all writers do, to some extent), this is a worthwhile add-on to install. It really shortens the time it takes to capture, find, and utilize key notes. In general, the more you can keep all of your productivity tools in one place (i.e. 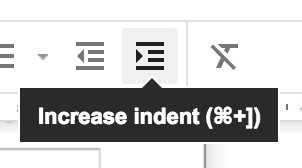 in Google Docs), the better off you are. This is subject to your specific experience and use case, but if you’re writing for international audience, the Google Translate add-on is a must. Even if you don’t currently write for international audiences or localize your content, it might be worth checking out. It makes it so easy to localize content that it may inspire you to do so (and widen the net of your possible audience you can reach). LucidCharts lets you easily create and insert flowchart, UML, wireframe, mind map, and more diagrams directly into a Google Doc. I’m a big fan of measuring the effectiveness of your blogging. The better you can do that, the more visibility you have into your progress and results, as well as how you can improve. SuperMetrics is a wonderful product that allows you to blend together various forms of data, including from Google Analytics, Facebook, YouTube, Twitter, AdWords, Bing Ads, Moz, and Google Webmaster Tools. That’s their core product, anyway. 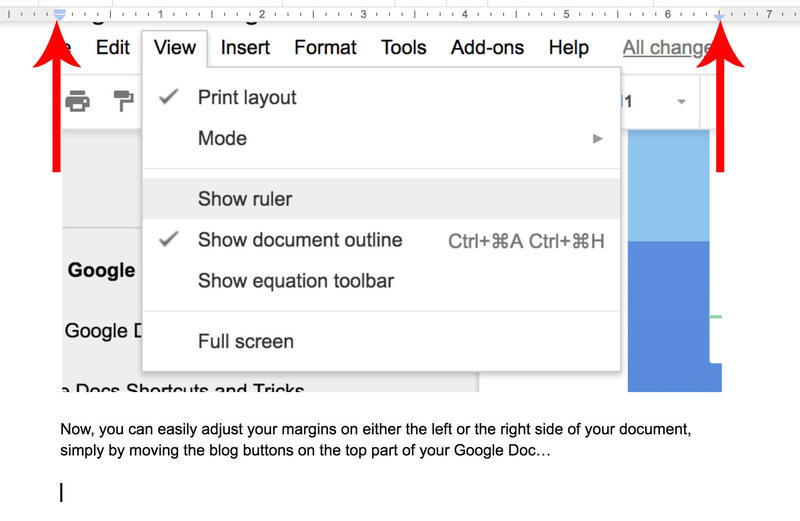 The Google Docs add-on lets you pull this information into your Google Doc for easy access. This makes it easy to write up internal reports, but it can also enable you to add different charts and graphs for blog post publications too. 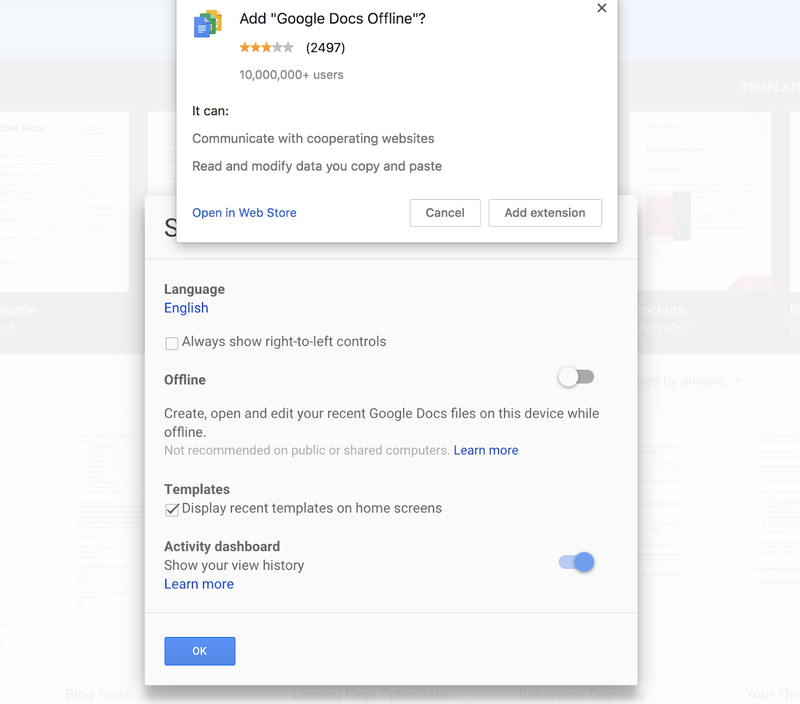 We’ve already covered Google Docs add-ons that help you blog more effectively, but there are a few tools that may help you squeeze even more out of the arrangement. You’re on the Wordable blog, what did you expect? Wordable is going to save you more time than any other tip on this list. It’s also super easy to use and not expensive whatsoever. What’s it do? 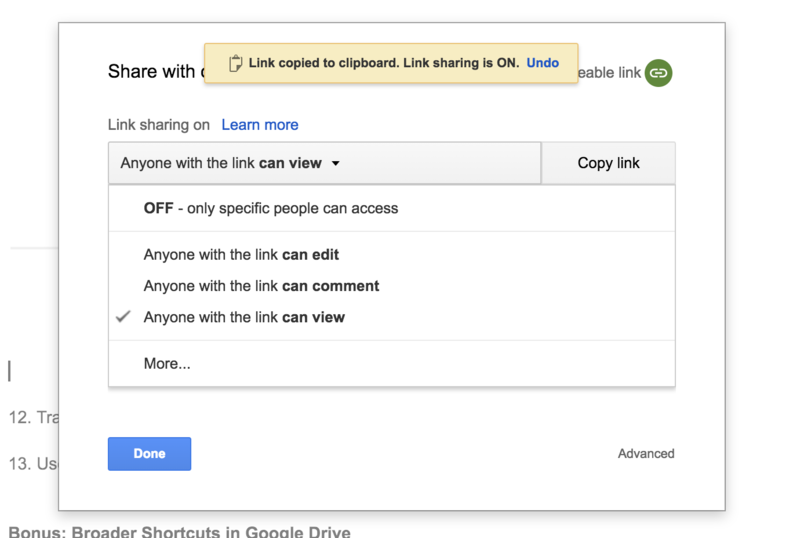 Lets you upload your Google Doc to WordPress, in perfect format, in mere seconds. How long does it usually take you to rewrite your blog post in WordPress? An hour? Two? More? Recapture that time. Give Wordable a try. It might work for you. I already mentioned Grammarly above, but I wanted to reiterate here. 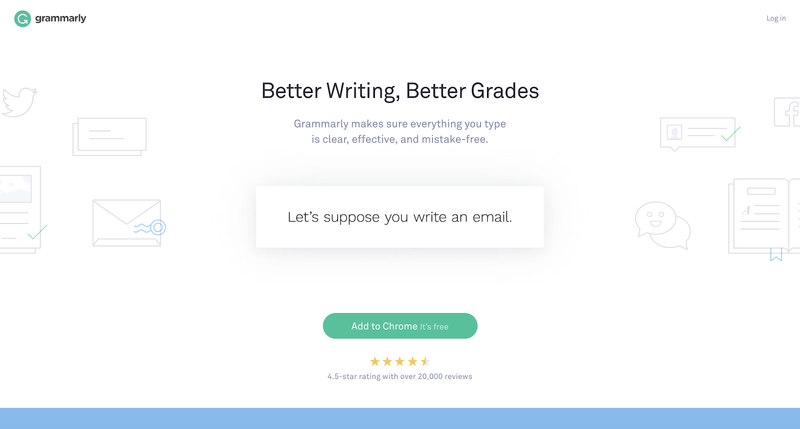 Grammarly makes your writing better. Spend a bit of time staring at a blank page. Catch some inspiration and furiously write a blog post. Throw it all out there. Clean up the errors and sloppy language. Edit for format, structure, and style. Look at step three. Almost everyone has some sort of this. Your first draft is almost always dotted with simple errors due to writing quickly. 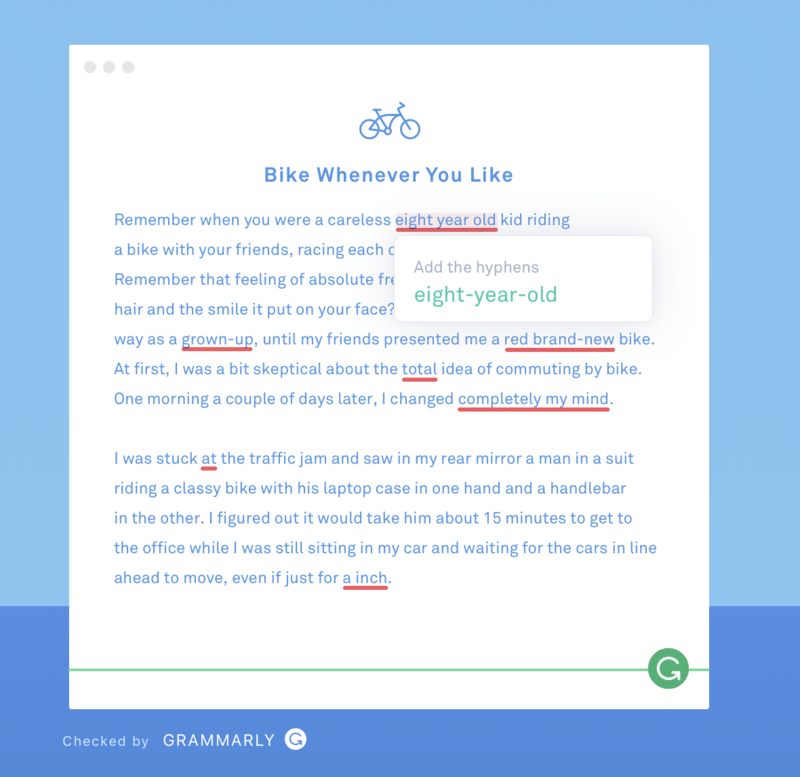 Grammarly will help you surface all those errors and fix them, ultimately saving you time to focus on producing high value content. Trello is a simple workflow management tool that can do many things for many different people. First and foremost, in this context, it’s a tool you can use to build out and manage an editorial calendar. With increased productivity and publication frequency, it becomes more and more important to manage your workflow, ideas, and scheduled posts in a single location. Especially if you’re working with multiple contributors, you need something like this to keep you sane. Trello makes it super easy to visual the discrete stages of a project and article creation, and it’s also easy to collaborate with others. Trello is the best solution I know for editorial calendar creation, mostly because of its simplicity, flexibility, and ubiquity. If you have a propensity to speak in undue hyperbole and use dazzling displays of vernacular prowess, foregoing the prosaic prose that helps one comprehend, then you should probably get a tool to help you write more simply and with more clarity. Hemingway helps you do that. 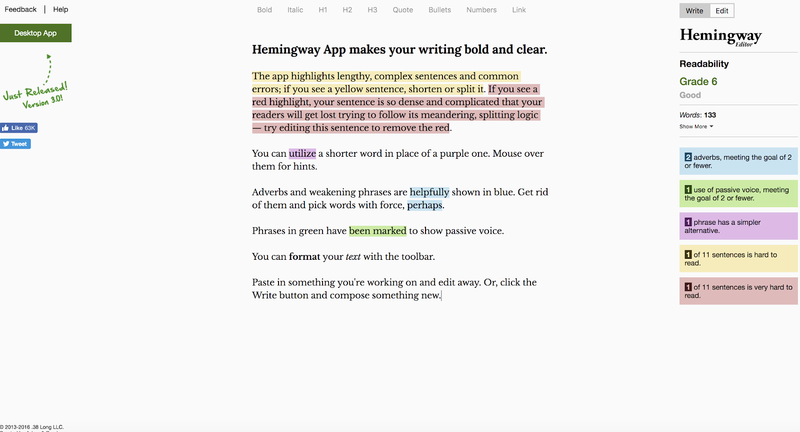 Basically, if Grammarly helps you avoid sloppy writing and general writing mistakes, Hemingway helps with your style. Readability is a huge issue with blogging; particularly because readability and the reader experience probably helps you rank in search engines. If you’re already go a crisp writing style, maybe you don’t need this. But it still may be worth checking out. This may sound strange, because Google offers its own survey solution. 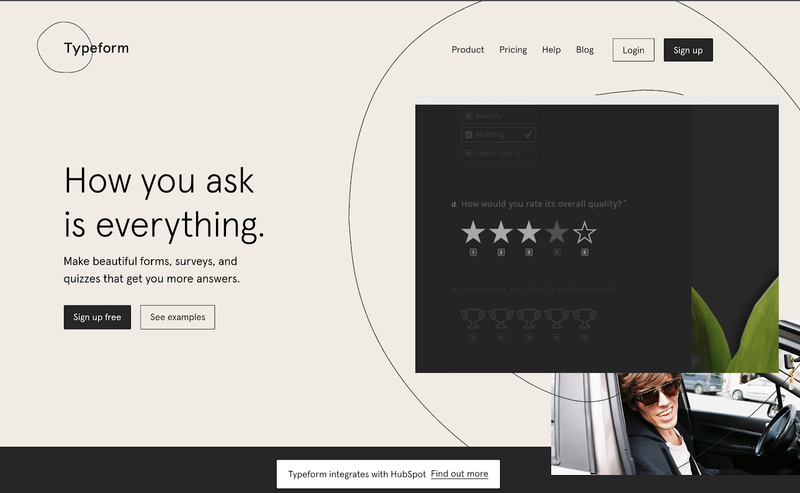 Google Surveys are great, but TypeForm is better. And if you’re doing many interviews in your content creation, you’re probably using some form of survey tool. How awesome would it be if you could automate the process of transporting the data and submissions from said forms. Well, thanks to Zapier, you can. Just use this Zap to set it up, and you’ll save tons and tons of time manually bringing your TypeForm data over. Google Docs is the best way to create content. 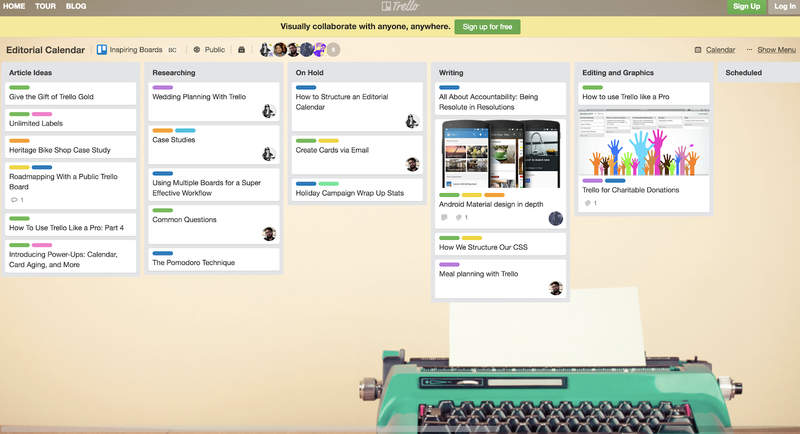 It’s collaborate and offers a ton of tools out the box to make you productive. More, it offers many add-ons and additional tools to really rev up the quality (and frequency) of your blog posts. Basic productivity advice for bloggers. 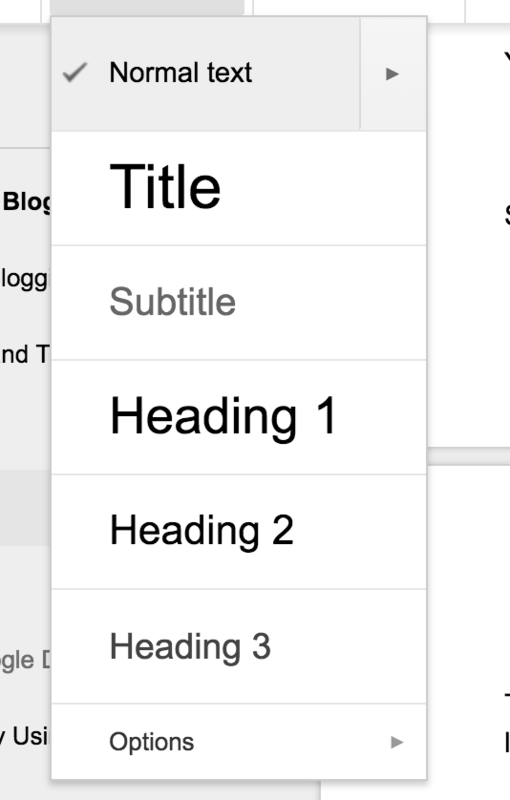 A Google Docs blog template. There’s more to talk about with Google Docs; of course there is, no topic this popular can be covered in a single blog post. But this post hit most areas of productivity in Google Docs for bloggers, at least the important ones that actually work. If you feel like we missed anything major (tools, tricks, routines), make sure to give a shout in the comments. I saved a ton of time importing this post from Google Docs to WordPress in one click using Wordable.